The Wedding Season usually runs from May to October, with most couples choosing to get married between those months. It is wonderful to have at least part of your special day outside, but as we know, even in our summer months, British weather is extremely unpredictable!! As a wedding celebrant, I have led wonderful ceremonies all year around and have discovered that every season has its own beauty. This 4-part series looks at each season in turn and considers how its uniqueness and beauty can be captured to enrich and enhance your special day. Part 1, looked at the beauty of winter weddings and now, we move to our next season, and capture the special magic of spring weddings. One of the most beautiful times of year to get married. The air seems fresher, the days are getting longer, the sun is beginning to shine again and spring fever fills our hearts. Spring weddings are full of pretty pastel shades of yellows, greens and blues. They really give your guests a wonderful opportunity to dress up, and wear some colour, after the dark days of winter. 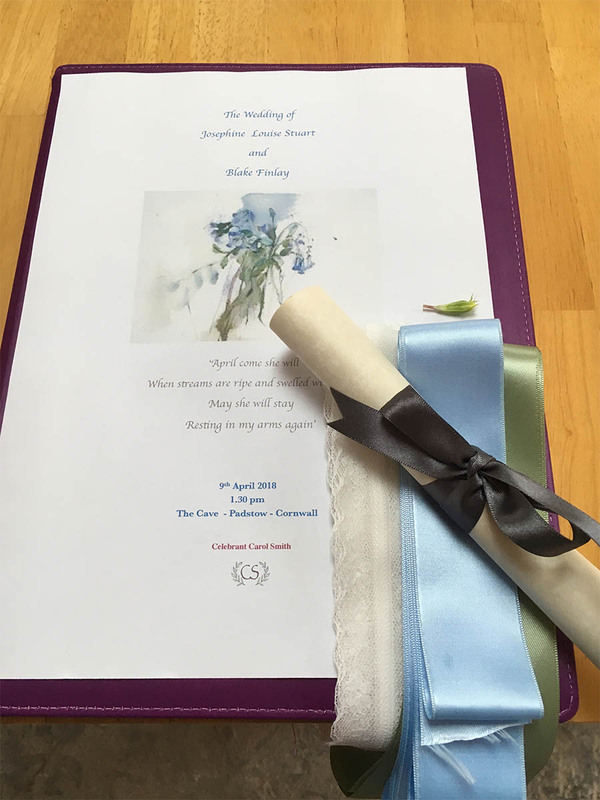 As a wedding celebrant, I have noticed that I’m often asked to perform a handfasting ceremony, as part of the wedding ceremony, by many couples choosing to get married in spring. I often wonder if this is partly due to the extra splash of colour the handfasting cords and ribbons bring to the occasion, especially if they are waved aloft by the bride and groom when the unity cord has been tied!! Handfastings really add an extra dimension to a wedding ceremony, so here’s a little bit about them and some ideas. Handfasting was originally an old pagan custom, dating back to the time of the ancient Celts. Today, many non-Pagan and non-Wiccan couples are adopting the custom, as couples choose to borrow from other traditions in order to personalise their wedding ceremony and make it unique to them. There are many variations of the traditional handfasting. After the bride and groom both declare their intent to enter into the union, the hands of the couple are clasped and fastened together with a cord or cords just before, just after, or during the vows they make to one another. Generally the couple choose to face one another, binding both of their hands together. Or they may choose to have only their right hands tied together, or a right hand with a left. It’s completely their choice. The wrapping of the cord forms an infinity symbol. The handfasting knot that is tied is a symbolic representation of oneness between the couple. In a show of unity, they become bound to each other. The couple can choose the colours, length, type and of number of cords or ribbon used for the handfasting. One couple whom I handfasted during their wedding ceremony, used strips of material they had bought on their travels, with shells and talismans from all around the world. Another couple chose five ribbons for their ceremony. Each colour represented a value on which they based their marriage: trust, honesty, commitment, openness and humour. They were bound around the couple’s hands by five of their closest friends. This was very significant for their friends, as it enabled them to take part in the wedding ceremony. For another couple, the four elements of earth, fire, water and air, were represented by their ribbons. They asked that I did the binding, as their wedding celebrant. This was an enormous privilege for me, and I will always have a special bond with them. You can see, just from the three examples above, how having a wedding celebrant for your wedding ceremony can personalise every aspect of your wedding, to make it unique and personal to you. Wedding guests are always enthralled to watch a handfasting – an unexpected surprise, and a memorable event. Having a wedding celebrant also means you are not restricted to where you hold your ceremony. 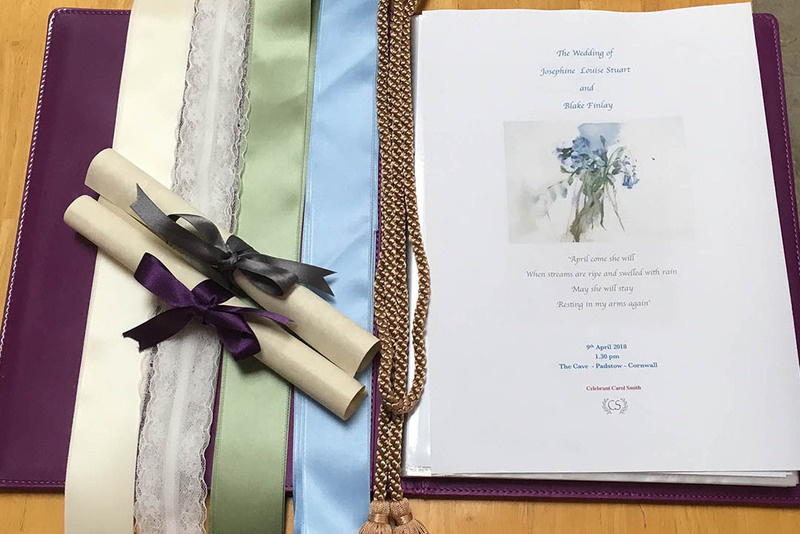 You may be hoping that the weather will be mild enough to have your ceremony outside, maybe in a field or favourite meadow, in beautiful grounds or gardens, with new spring foliage and blossom on the trees. Unfortunately, in spring, the weather can still be quite unpredictable. This is often the time of year when marquees or tepees come into their own, as a fantastic contingency plan, should the skies open!! I had the privilege to lead a beautiful wedding ceremony, in the dance floor space of a tepee, underneath a fabulous rotating mirror ball. As the afternoon sky became grey, the tiny fairy lights were lit and the ceremony had a magical fairytale glow. For a bride, choosing what to wear is a big consideration, so I have invited Hannah from Bridal Reloved, Street to share her tips and ideas for Spring wedding dresses. Another big consideration for a bride is knowing what flowers are in season and what to choose. As a wedding celebrant, I recognise the important part flowers play in a wedding. They are not only for bouquets and buttonholes, hair pieces and crowns, but play a big part in decorating spaces, softening a rustic barn, lining an arch, table centerpieces, petals for confetti throws and lining an aisle. Many couples will choose their wedding colours around their flowers! I have asked an extremely talented florist, Lorna, from Luce Loves Flowers to share her tips and ideas for Spring wedding flowers. ‘As a Florist I love the spring, with the garden awakening, a beautiful range of flowers begin to bloom, Hellebore, Fritillari, Anemone, Muscari, Hyacinths and of course the ever so popular Tulips! With a varying range of colours, perfect for many styles of weddings, I always think spring flowers look so simple and charming, soft delicate and natural. Rumour has it that 2018, deep rich purple tones will be trending!! Spring wedding fare moves away from the heavier plates of winter to something lighter, and fresh, like fish or chicken, with cooked baby vegetables or asparagus spears. Bring in fresh herbs and give them a seasonal touch with edible flowers like primrose or pansy. With deserts, choose lighter dishes and flavours, like vanilla, lemon and berry mousses. Or how about afternoon tea, with a vintage tea pot, mismatched crockery and bunting and lace to complete the look? Three or four sugared almonds in a little netting, tied with lace or satin ribbon would be perfect old school wedding favours. Prosecco is always popular at weddings at any time of year. Adding a fruity element, like a few seasonal berries, will continue the seasonal theme. I really enjoy being part of a couple’s special day at this time of year, for a spring wedding is a romantic wedding. it’s a pretty time of year with nature bursting into colour, and the sky full of birdsong. Spring is a time of new beginnings, symbolic of love, hope, youth and growth. It is the perfect time to embark on the next stage of your life as a married couple, together. In the next post in this series, I will look at summer weddings – the weather is warmer, the buds are out and the sky is bluer, what’s not to love about this season?